Thanet Coast SAC is a 28 km2 intertidal site designated for two Annex I habitat features; reefs and submerged or partially submerged sea caves. Eighty-seven percent of the SAC is comprised of marine areas and sea inlets, 10% is tidal rivers, estuaries, mud flats, sand flats, and lagoons (including saltwork basins) and the remaining 3% is composed of shingle, sea cliffs and islets (JNCC, 2015). Thanet Coast has 23 km of chalk cliffs, making it the longest continuous stretch of coastal chalk in the UK. 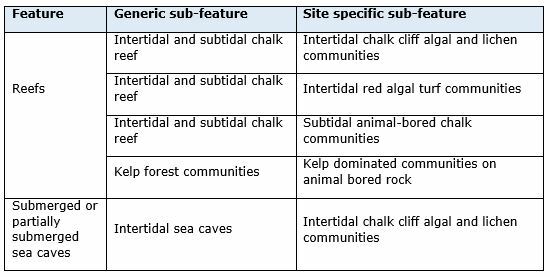 The chalk cliff face, cave and tunnel habitats are very uncommon in Europe and these are considered to be the best examples of their kind in the UK and of the highest international nature conservation importance (Natural England, 2000). Thanet Coast chalk reefs represent approximately 20% of the UK resource of this type and 12% of the EU resource (Natural England, 2000). Six kilometres of the coastal profile remain in a natural state and uninterrupted by manmade features, making this area particularly important (Natural England, 2000). Chalk reefs here consist of sublittoral chalk platforms which extend into the littoral forming chalk cliffs. Thanet Coast chalk communities are unique due to both the high turbidity of the water and the unusually soft Cretaceous chalk which forms the reefs (Natural England, 2000). This results in an unusually rich abundance of chalk boring species, including algae, piddocks (Barnea spp., Pholas dactylus, Hiatella arctica and Petricola pholadiformis) and Polydora ciliate (Natural England, 2000). Thanet Coast has around 90 caves or cave-like features as well as some stack and arch formations, making it the second most extensive representation of chalk caves in the UK. Due to large variability in the size and aspect of these caves, they support specialised and varied algal and lichen communities, including as Pseudendoclonium submarinum and Lyngbya spp. Commercial fishing, including potting and netting, occurs within the site. Trawling also occurs outside the closed area. Harvesting of bait and shellfish occurs from the shore both on a commercial and recreational scale and has caused a small amount of physical damage to the reef. There is a commercial port and two small harbours. The coastal area surrounding Thanet Coast SAC is heavily built-up, with a resident population of 120,000. Levels of tourism and recreation activity are high with, 2 million visitors per year. Recreational activities in the SAC include bathing, dog walking, shore angling and fishing from small boats. To protect infrastructure, coastal protection works have been constructed along 75% of the cliff face. KEIFCA is responsible for assessing the effects of commercial fishing within this site and must implement appropriate conservation measures to avoid damage to EMS by fisheries activities. 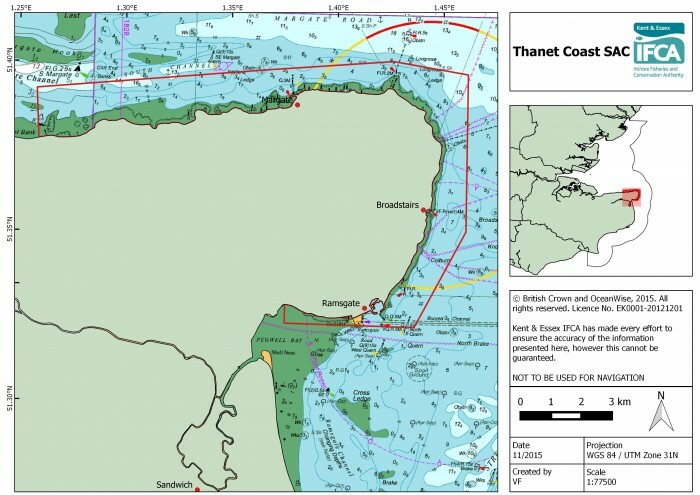 In Thanet Coast SAC the intertidal and subtidal chalk reefs have been identified as at risk of damage from bottom towed fishing gear, and in response KEIFCA have implemented a Byelaw prohibiting the use of this gear over the chalk reef features. In addition to assessing the site and creating management plans, KEIFCA is also responsible for the enforcement of fisheries bylaws and regulations within this site.